Our environment comprises children of mixed-ages, allowing the young ones to have role models to look up to and learn from “teachers” much closer to their ages, while providing the older the opportunity to strengthen their leadership skills and cultivate their compassion through being responsive to the needs of the younger children. There are four main areas within our environment. Washing, sweeping, dusting, slicing apples, preparing lemon water, window washing, buttoning, tying shoe laces… household activities are familiar to children through everyday life. In our environment, children practice these activities using materials tailored to their size so they are able to manipulate each piece comfortably. By working in this area, children gain essential life skills, which helps build their independence and self-esteem. In addition, these activities help children refine their movement coordination and develop powers of concentration, abilities essential for their future learning. During the beginning years, children are in a self-construction process and the brain is developing at a tremendous speed. They gain multi-dimensional understanding of the world by exploring and absorbing through their acute senses. Specifically designed sensorial materials help children gain accurate information about the physical properties of the world (color, dimension, weight, shape, etc.). Each sensorial material is designed scientifically with precise measurements, isolates a specific quality for the child to focus on, and represents materialized abstraction to help bring clarity to abstract concepts. The young child is receptive to language in all forms: spoken, written, music, art, as well as mathematics. Our first emphasis is on spoken language development. We provide a rich language environment by modeling proper, precise, and grammatically correct spoken languages in both Chinese and English, and providing daily opportunities of telling stories, reading books, as well as having day-to-day conversations. In such an environment, children's love for language is cultivated. Writing and reading then come very naturally as pleasant experiences for children. Every child's innate mathematical potential is fostered by the unique approach in the Children's House. Mathematical concepts are first introduced in a concrete form. Working with the concrete materials builds a solid foundation of children's understanding and prepares them to gradually understand abstract concepts. Children of this age are able to carry out the basic numerical operations with understanding. 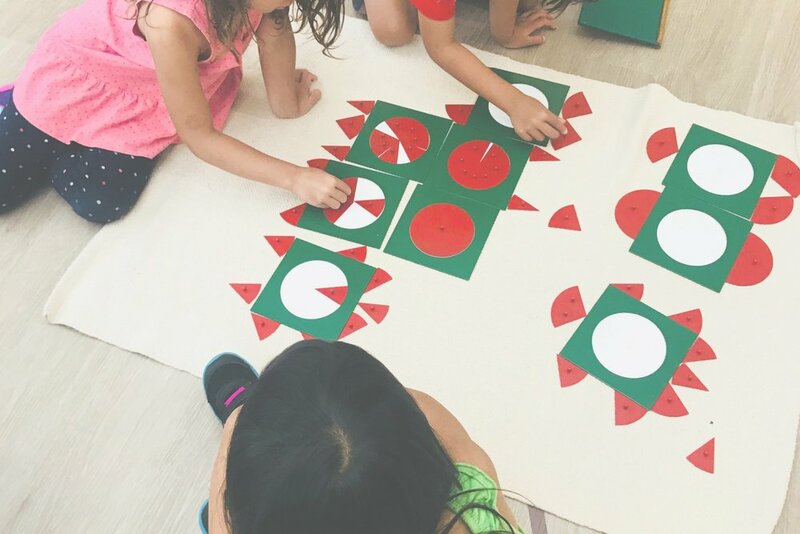 They work happily with large quantities, fractions, geometry, and powers of and roots of numbers, concepts conventionally considered too advanced for the young mind. Integrated into the above four areas are art, music, geography, science, botany, as well as zoology to provide a whole learning experience. Our approach to art starts with the understanding that art is a way of self-expression. Therefore, we do not directly “teach” art. Rather, we prepare children physically as well as intellectually to freely express themselves. Practical Life activities as well as certain Sensorial materials help prepare the hand so that the child acquires the fine motor skills necessary for artistic expression. We provide quality artistic tools and introduce the materials with a focus on the techniques and not on the final product. The goal is to offer keys to exploration and discovery, rather than to impress others. Music is very much alive in our environment, from singing and listening to both Chinese and English songs, playing rhythm activities, to experiencing various musical instruments. The most captivating of all, the bells, is a set of elegant material in the Montessori environment. As children work with the bells, which produce beautiful and precise sounds, their auditory sense in terms of discriminating pitch is refined. They also learn the order and pattern of music, which aides their mathematical minds. Gradually, children learn the names of the notes, and start to creatively express themselves. © 2019 Twin Cities International Bilingual Montessori School. All Rights Reserved.